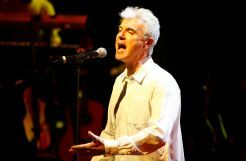 David Byrne, a true renaissance man, has been the leader of an intellectual new wave rock-band Talking Heads, an actor, a filmmaker, screenwriter, and composer of musical scores. Born in Dumbarton, Scotland, he was raised in Baltimore after moving to the U.S. at the age of seven. As a young man, he studied photography, performance and video production at the Rhode Island School of Design and the Maryland Institute College of Art. 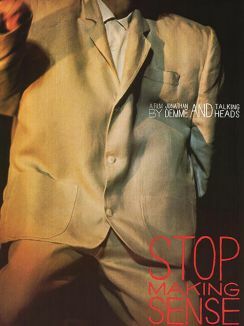 In 1984, he and the Talking Heads were the subject of Jonathan Demme's concert film Stop Making Sense. He then tried filmmaking with his off-beat satire of Texas life True Stories (1986). 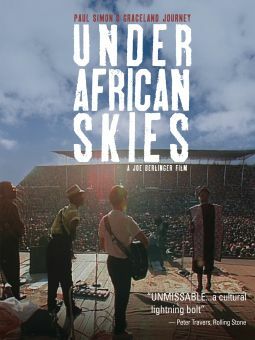 Some of Byrne's quirky songs have appeared in feature films as well. 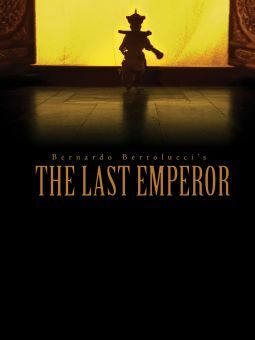 In 1987, he and co-composers Ryuichi Sakamoto and Cong Su won Academy Awards for their musical score for Bertolucci's The Last Emperor. He directed the 1989 documentary Ilé Aiyé, and made memorable contributions to Heavy Petting that same year. Over the ensuing years, he contributed to the score for many films including Magicians of the Earth, The Book of Life, and Young Adam, as well as the Sean Penn starring This Must Be the Place, which took its title from an old Talking Heads tune. Was born in Dumbarton, Scotland, but was raised in Baltimore, MD. Formed a band called the Artistics with Chris Frantz and Tina Weymouth in the early 1970s, and this group eventually evolved into the Talking Heads. Made his full-length debut with the band on Talking Heads: 77 (1977), which featured the group's first hit, "Psycho Killer." Ventured into composing in the early '80s, creating the scores for Twyla Tharp's dance project The Catherine Wheel and Jonathan Demme's big-screen comedy Married to the Mob (1988). Made his directing debut in 1986 with the episodic comedy feature True Stories, which he also starred in and wrote. Released his first traditional solo album, Rei Momo, in a joint venture with Sire Records and his own world-music label, Luaka Bop, in 1989. Following the Talking Heads' dissolution in 1991, he refused to participate in a reunion five years later. The remaining members rechristened themselves the Heads and recruited guest vocalists for their poorly received 1995 album No Talking Just Head.